Příšov Brewery. Our microbrewery began in 2014, when we brewed our first 11° light lager. In 2015, our beer won second place at the Prima Fresh Festival 2015. This award is for us a great success, a reflection of our work, and a huge commitment for the future. Our main products are pilsner-type 11° and 12° and are brewed using the decoction brewing process. They are hopped three times using the hops Premiant, Sládek, and Saaz. Primary fermentation takes place in the fermentation room in open vats for about a week. Temperatures are kept low both during fermentation inoculation and during the actual course of the main fermentation. We use the H yeast strain in the fermentation of our beers. Secondary fermentation and maturation takes place in lager tanks at moderate pressure and at temperatures close to 0° C. After 5 weeks of maturation, the beer is ready and can be tapped for customers. We currently tap the lagers 11° Příšov, 12° Příšov, 13° semi-dark Viennese, and 14° IPA. Our brewery Jan Illgner is constantly inventing attractive beers for the occasion. 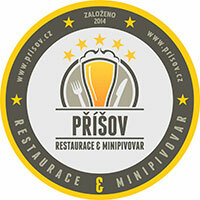 Our beer is available in our restaurant and microbrewery where you can also see the boiler. Brewery tours are possible after by prior telephone arrangement. We regularly participate in selected beer festivals, where we’re usually successful and often take third place.